Es Capdellà is a small village in the municipality of Calvià, situated 115 metres above sea level. A three kilometre road communicates it to Calvià. It is also linked to Puigpunyent via Galilea, to Andratx via the Coll de n'Esteve and to Peguera descending between the Moleta de Son Vic and the Puig des Revell. These three mountain roads are all recommendable to enjoy the extraordinary views over Calvià and Andratx. 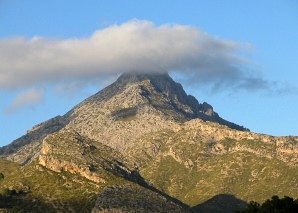 The imposing presence of the Puig de Galatzó, 1027 metres high, dominates the rural scenery of the village, that was built between the XVII and XVIII centuries by workers of the old manor houses in the area. Formed by a small urban centre and some outlying houses, it now has a population of 1000 inhabitants, amongst whom are many foreigners who have chosen this peaceful place for their residence. In the centre of the village is the church of Mount Carmel (Verge del Carme), built in the XVIII century and the beginning of the XIX century. The Bar Nou is also important as it is the central meeting point for the village and a stopping point for numerous tourists who make trips around, either on foot, by bike or car. This popular restaurant serves Mallorcan cuisine and specialises in the giant prawns. On the outskirts of the village there are some outstanding manor houses. On the road to Peguera are Son Vic Nou and Son Vic Vell, on the road to Calvià the Ses Algorfes property and on the road to Galilea Son Martí, with the Fonts Ufanes (periodic surface springs) as the main attraction. On the road to Galilea you can also find the Galatzó houses, an old property that used to belong to Ramon Burgues-Safortesa i Fuster, Count of Formiguera, one of the most powerful Mallorcans in the XVII century. According to the legend in the XIX century, inspired by the legend on the Count Arnau of Catalunya, the Count of Formiguera became the infamous Comte Mal, who, because of his cruelty, was condemned to ride eternally through the night on his black horse surrounded by flames. Es Capdellà celebrates its annual festivities in July for the Verge del Carme.